Are you ready to play? 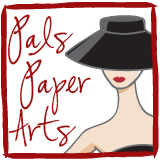 Come back tomorrow so you can see the Pals Paper Arts Challenge for this week. I am off to Hawai'i, so my blog is on auto pilot! If you need any Stampin' Up! please use my website to order any time. Patti...I can tell this is going to be cute! Can't wait until tomorrow!